Flourtown Fire Company and Wyndmoor Hose Company were dispatched at approximately 3:30PM to reports of a car crash into a building around 613 Bethlehem Pike in Erdenheim. Multiple callers reported two individuals trapped in the vehicle and extensive damage to the building. Squad 6 and Engine 6 responded along with Rescue 82. 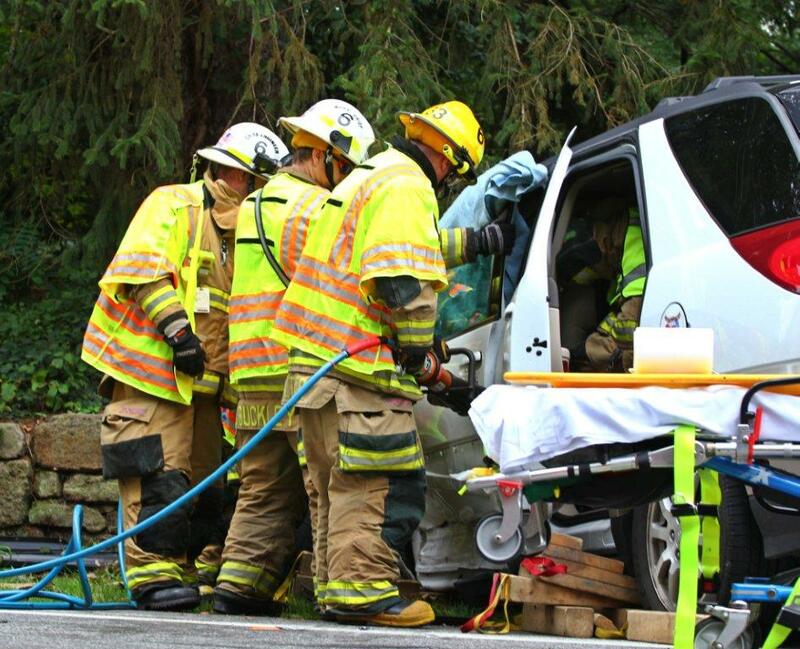 Stabilization of the vehicle and patients was followed by a decision to cut and flap the entire roof of the vehicle so extrication of the driver who was laying on the drivers door and a passenger could take place. 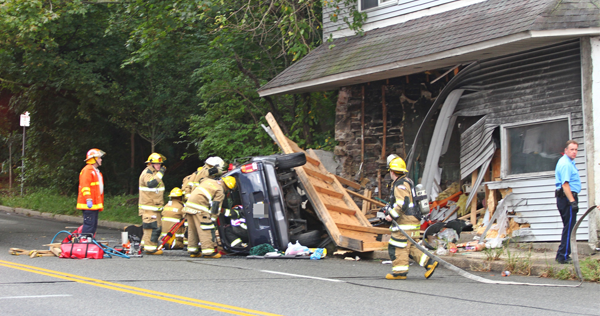 Following extrication, and removal of the vehicle by Flourtown Texaco, lumber from Rittenhouse Lumber across the street was used to stabilize the building which had a large portion of its street facing wall destroyed in the crash. 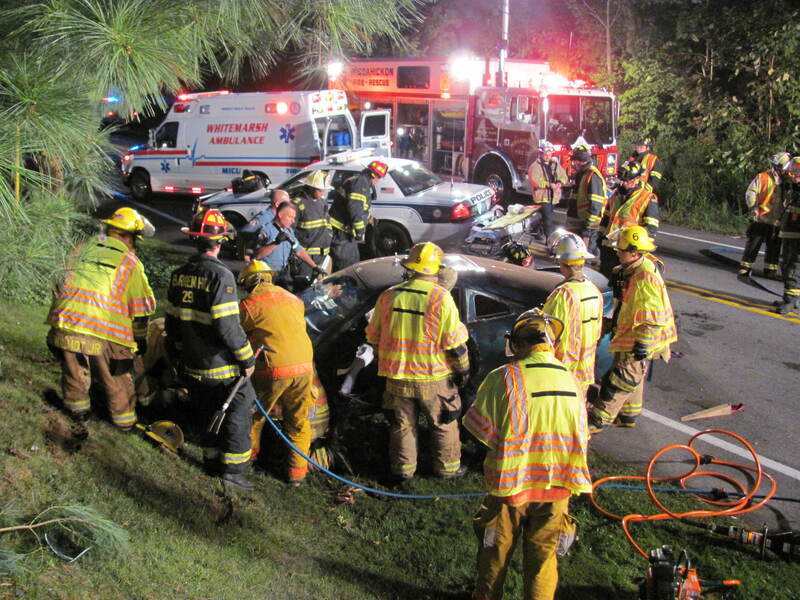 Squad 6 and Engine 6 responded to a three car vehicle accident on Skippack Pike (Route 73) just past Joshua Road on Monday, September 5, 2011. The driver of a white SUV, complaining of having difficulty breathing, was extricated from the vehicle. Squad 6 popped the driver’s door and the patient was removed. All others involved in the accident were out of the vehicles. Utility 6 along with Traffic 29 handled closing down Route 73 until the accident scene could be cleared. Rescue 29 also responded and assisted Flourtown Fire Company on the scene. Photo by Bob Wilmot, Jr.
A vehicle into a tree at 1307 Paper Mill Road was the dispatch. Rescue 82 and Squad 6 responded and found a young driver had struck a tree at the address after losing control. The vehicle a SUV struck the tree in the area of the drivers door. Using the Homatro rescue tools off Rescue 82, Flourtown’s crew assisted with patient extrication by removing the driver’s door and pulling a hose line for safety purposes. Squad 6, Engine 6, Utility 6 along with Rescue 7 (Wissahickon) and Rescue 29, (Barren Hill) responded to a vehicle accident along Route 73, just South of Butler Pike. The vehicle left the roadway, struck a tree and the vehicle came to rest back on the roadway. 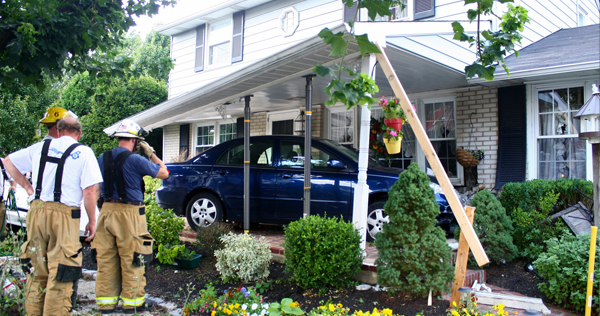 The one occupant was extricated from the vehicle by stabilizing with cribbing and removing the driver’s side door.